Wonder what to make for your Halloween party? 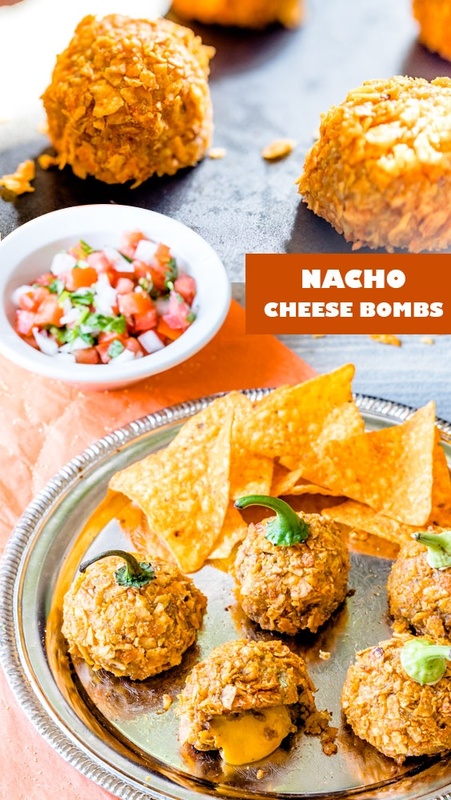 Beside all the “vamp” versions of candies n stuffs, something fun, something finger-able like these nacho cheese bomb would slurp the fun while getting your guests full along the way. 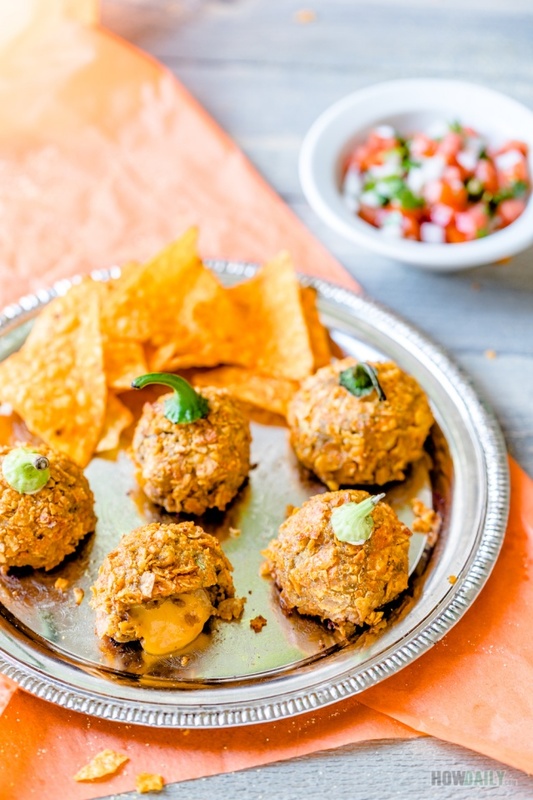 The fun thing about these nacho balls is that there is a bit of everything: beef taco, pico de gallo and hot oozing cheddar in every bite. For more convenient, you can make these ahead of time, and start baking 30 minutes before the party start. Left over? Just freeze them until the next football afternoon, pop in the oven to reheat and they’re good as new. 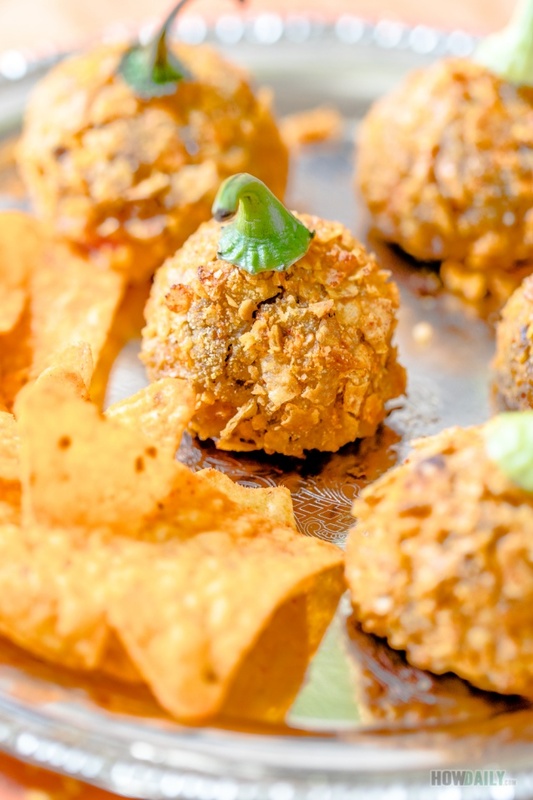 These nacho cheesy balls are pretty nice finger food to enjoy along with garnishments like avocado cubes and spoon of salsa or diced tomato. They will be all you need beside candies for Halloween. Oh, don’t forget to save those stems from jalapeno. Can’t stand the spice, replace with pretzel sticks instead to shape them like cute little pumpkins. 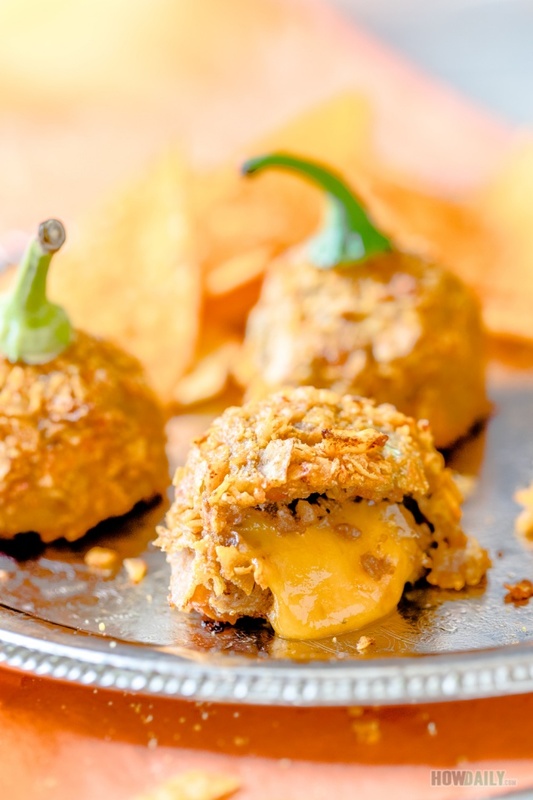 Fun treat with crispy outer nacho bombs and in with oozing cheddar. Top up with some sour cream, guacamole and pico de gallo. Just a few cilantro stems or jalapeno to have some Halloween pumpkin. In a large mixer bowl, use a fork or mixer to crush ground beef, soak it with 1/2 cup stock to loosen up a bit. Prepare the pico de gallo by finely dice up tomato, white onion and jalapeno. Then shake them with garlic powder, heapful spoon of minced cilantro and dashes of salt & pepper to taste. Add 3 Tbsp of the pico de gallo to ground beef mixer bowl, save the rest in fridge to chill until ready to serve. Add bean, 1 egg and all the nacho seasoning ingredients to mixer bowl. Combine well. Fork the other egg in a small bowl. Pour corn meal in another. Crush two handful of tortilla chips. Preheat oven to 375 F. Line your baking pan/tray. Pluck about a spoon of the meat mixture, then use the palm of your hand to apply pressure and knead it to encapsulate around a cube of cheese. Make sure to cover the cheese cube entirely, then roll it between your hand to form a round ball. 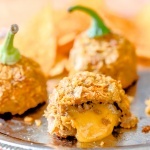 Dip and roll this ball into cornmeal, once cover, quickly dip into fluff egg then roll onto crushed tortilla to coat. Place this ball onto baking tray. Repeat the above steps till the end of meat mixture. Once done, bake for 20 - 25 minutes. To serve: for each cheese ball, add a tiny spoon of guacamole and sour cream on top, then garnish with remaining pico de gallo and diced avocado. Save a few cilantro and jalapeno stems to place on top of cheese ball to resemble that of a pumpkin, or use pretzel sticks in place if you could.